I spend a lot of time reading forums related to e-books and e-readers, including the official forums at both Amazon and Barnes & Noble. I’ve seen countless posts by readers decrying (a) high e-book prices (the agency model and $14.99 e-books), (b) delayed e-book releases, (c) publishers blocking text-to-speech, (d) annoying DRM attached to e-books (and the incompatibilities that result), and (e) recently, publishers blocking the lending feature (which B&N has had for a while and Amazon just added). In this new age of digital reading, readers DO have the power to help shape the new rules of the game. Readers control all the money spent on books, and that’s always been the case. Publishers will try to raise prices, window releases (delaying e-books), block text-to-speech, block lending, institute DRM, and their new frontier will be trying to get us all to read online in the “cloud,” which just allows them to lock down the content more effectively by preventing us from downloading a file. But the thing to remember is that publishers can only get away with what readers allow them to get away with. Not all publishers are on the agency model (5 of the “Big 6” are, but Random House and smaller publishers are not). If readers refuse to buy books over a certain price, or with certain features blocked, or that do not allow us to download the file we’ve paid for, or whatever, then publishers will have to cave in and give readers what they want. We’ve already seen that readers generally wouldn’t pay $14.99 for new releases, and publishers lowered them to $12.99, which enough people seem to be paying. Readers DO have choices. There are a million books a year published in the U.S. alone, and most of them don’t go through large publishers. Many books are sold for much lower prices, enable lending and text-to-speech, and don’t have DRM attached. True, you might have to take a chance in finding some new authors and you might not love all the new authors you find, but it is a choice, and the choices that readers make now will shape the way e-books are read for decades to come. One aspect of e-books that can be confusing is the question of which e-books can be read on which e-reader device. E-books from Amazon, B&N, and other vendors can come in different file formats, and Kindles, Nooks, Sony Readers, Kobos, and other e-readers may each read certain e-book formats and not others. It’s a mess that’s similar to where digital music was 5 or 10 years ago, with various confusing file formats (thankfully, music has pretty much standardized on the MP3 file format now). 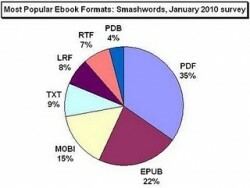 There are three major e-book formats: PDF, ePub, and MOBI, along with a host of minor ones. PDF is a file format you may already be familiar with; it’s not specific to e-books, but was designed by Adobe as a “Portable Document Format” that retains formatting and can be read on many different kinds of computers or other devices. It’s useful because PDFs can be read on almost any computer or e-book reader, and because the formatting and any pictures or charts should be well preserved. However, it’s not an ideal format for e-books because it doesn’t normally allow for re-flowable text: a PDF is like a photograph of a printed book page, so you can’t adjust the font size or style. ePub is the closest we have to an industry standard e-book format, as it’s used by Barnes & Noble, Sony, Kobo, Apple, and others — pretty much everyone other than Amazon. ePub is based on HTML, and allows for re-flowable text (so you can increase or decrease the font size, which is an important feature for e-book readers) and other e-book features. There are a few other minor formats, like LRF (the old Sony Readers used this), PDB (Palm Pilot format), and regular old TXT (plain text) or RTF (rich text) formats — like you might see on your computer. The problem lies in another acronym altogether: DRM. DRM stands for Digital Rights Management, and it’s a type of copy protection that many publishers and retailers add to e-books in order to prevent piracy (unauthorized copying and distribution). DRM has plenty of plusses and minuses I’ve discussed before and won’t get into right now, but publishers are pretty enamored with it for the moment, so the fact is that most best-selling e-books from most retailers have DRM attached. When DRM is added to an e-book, it prevents that e-book from being converted from one file format to another. So, if it has DRM, you’d be blocked from converting a MOBI e-book you bought from Amazon to the ePub format to read on a Nook (and vice versa). Wait, it gets even better. You can’t read a DRMed, ePub-formatted e-book purchased from B&N on your Sony e-reader … even though both e-readers (the Nook and Sony) both read ePub files … and both use the same type of DRM by Adobe. But B&N uses a newer version of the Adobe DRM that the Kobo doesn’t support, so you’re out of luck. It’s madness. * Note: Amazon, B&N, and Kobo each make e-reading apps that allow you to read their e-books on various devices, including Macs, PCs, Android phones, and iDevices, so this alleviates the problem somewhat. There is some good news here. As I said, most best-sellers from large publishers have DRM attached. But there are literally millions of e-books out there without DRM attached — which means that, no matter what format you find them in, you can easily convert them to any format you need, even years later if you get a new e-book reader. (Of course, since it’s so easy, most DRM-free e-books will already come in multiple formats, and you can just pick the one you need anyway.) So, where can you find DRM-free e-books? Project Gutenberg. They have hundreds of thousands of public domain titles — books that were written before 1923 and are no longer under copyright. This includes many of the greatest works of literature of all time, including Pride & Prejudice, Sherlock Holmes, The Odyssey, The Count of Monte Cristo, all of Shakespeare’s works, and many more. Smashwords. Looking for something a bit more modern? Notice how I said earlier that most books from large publishers have DRM attached. Many smaller publishers and independent authors decide not to attach DRM to their e-books. Smashwords specializes in inexpensive, DRM-free e-books (in multiple formats) from independent authors. There are many other places to find legal, DRM-free e-books (both free public domain books and paid newer releases), these are just a few to get you started. Of course, if you’re sure you’re going to stick with one e-book / e-reader “ecosystem” (maybe you love Amazon and your Kindle and plan to stay with them forever), then DRM might not matter to you. But hopefully you’re now more aware of the interaction between e-book file formats and DRM, and what you can and can’t do with the e-books you purchase.